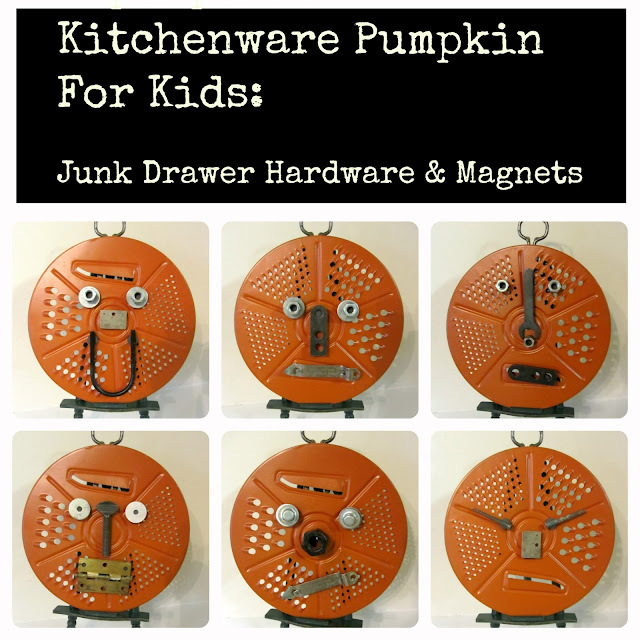 FALL JUNKERS UNITE WITH A KID'S JUNK PUMPKIN PROJECT, a pinboard and a link up! Here at Organized Clutter, I am constantly looking for ways to decorate and repurpose with vintage finds in my home and flower gardens. My project today is for junior junkers. Everything is magnetic so the Jack o'Lantern's face can be changed over and over with other junk drawer items. Obviously not for children under three, but older children may like creating new pumpkin faces and expressions with magnetic junk. With kitchen ware and utensils in steady and ready supply inexpensively at the local thrift shops, I was able to re-purpose an assortment of junk pumpkins this fall. My project today is the last of the re-purposed pumpkins and Jack o'Lanterns for this season. It starts with a vintage round grater and a thrift shop easel. Both were purchased for $2 each. The easel was painted green and distressed a bit with sandpaper. The grater was spray painted orange. For this pumpkin, I did not glue on all the junk hardware with E6000 like I did with the others. I attached the coke bottle opener with a magnet for the pumpkin stem. This face uses a beer opener, washers and nuts. Not sure what the nose piece is for sure. This face has closed nail "eyes", a metal rectangular nose, and the slicer's slit for the mouth. For this happy face I turned the grater upside down. You could do this project with any round layer cake or bakeware pan, if you can't find a round grater. Just make sure that a magnet will work on it. The possibilities are endless! I used nuts, bolts, washers, hinges, bottle openers, nails, small wrenches, regular junk drawer stuff that is easy to find. That's it, my last junk pumpkin of 2013, Wrench Nose! It's like the old Colorforms for junker's kids. 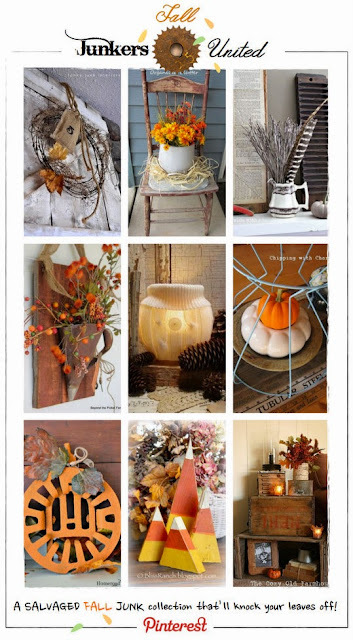 Fall Junkers United Pinterest Board! Now join me and the other Junkers for a Linky Party! We will be pinning our favorites. Such a cute idea Carlene. Kids would have a blast with this! I think your project is fabulous Carlene! I truly love them! I am an adult who loves magnets. This would be the gadget on my desk I would play with! that. is. hysterical. my kids would love it! What a fun project! I love that it's so kid friendly... I wanna do this with my grandson tomorrow! De l'art minimal... De belles créations... je reste admirative. Gros bisous et bonne fête pour Halloween. I could seriously play with these pumpkins for hours--just a big kid at heart! My kids would LOVE this! What a fun idea and so easy too! Thanks for the inspiration! You could make several and the kids could have face making contests! Cute idea Carlene! Carlene, your creativity and ingenuity are very inspring; thank you! Love and so impressed with your junk pumpkins. You are sooo creative, Carlene. Fantastic!